I’m convinced that there are so many life lessons to be learned by observing the garden. 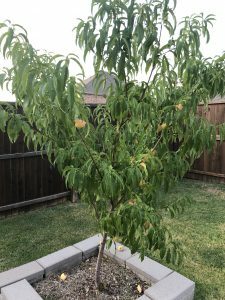 Last year, I planted two peach trees. They are two different varieties, but I couldn’t tell you right now what they are. I think I saved the tags from the trees. Anyway. They are about 10 feet apart from each other in my yard. One is slightly shaded by the house during part of the day. 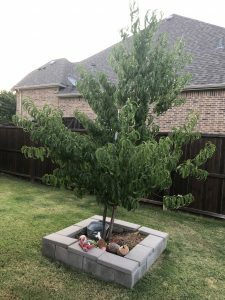 This Spring the less shaded tree had a TON of blossoms on it. I was SO excited. The one nearer the house had hardly any. As the summer marched on, tiny peaches developed where the blossoms had been. I was so excited. Still almost nothing on the other tree. At a certain point, the little peaches on the one tree just stopped growing. They just stayed little and useless. Meanwhile I noticed a couple of peaches had popped up on the other tree. The peaches on the less fruitful tree quickly surpassed the size of the more fruitful tree. In fact, I got several fully grown and ripe peaches from the less fruitful tree and they were wonderful. I haven’t gotten a single edible fruit from the tree with more peaches on it. This got me to thinking. Is it the same with us? Do we sacrifice actual results because we attempt too much? Would we have better results if we slowed down? Not only that, but might we feel better? Take a look at the two trees. The one that made less peaches looks like a much healthier tree. When it comes down to it, better results came from attempting less. This is the healthier tree. Less fruit, but they ripened. The leaves are a healthier color and there are more and stronger branches. This is the tree that had so many fruits. 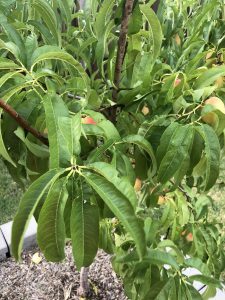 You can see that the leaves are lighter and some of them are clearly struggling from the weight of the peaches. Pondering 🤔… and think you may be on to something. Heather Hart, “it is better to do one thing well than ten things poorly”.